At midnight last night, I was glued to the television in shock. The results of the Swedish General Elections were confirmed. The shock wasn’t that there was a shift of power from right to left, nor that the current Prime Minister resigned. The shock was that 12.9 percent of the voters elected the right wing, populistic, nationalist party The Swedish Democrats (SD). 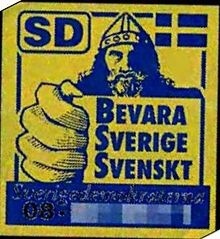 Positive thinkers focus on the fact that 87 percent didn’t vote that way, but the fact remains that around 800 000 Swedish people chose to put their vote on a party with origins in the nazi party. This action has resulted in a very unstable parliamentary structure and a minority government. This election highlighted just how split the nation is. The 87 percent who didn’t vote SD are all over the political spectrum, from left to centre to right. The biggest party secured only 31 percent of the vote. The cities voted differently from the provincial areas. The province of Skåne in the south of Sweden reinforced its position as the stronghold of SD. This is now Sweden’s reality. The question is how to address it for the next election. SD are not going away, no matter how much the established parties wish for it. The issues they represent resonate in the heads and hearts of a significant number of people in society – restricted immigration, tougher punishment for criminals and better conditions for pensioners. I believe the people who vote SD don’t perceive themselves as racists. So calling them racist probably doesn’t change their perceptions. With their vote, they have communicated their concerns on the development of Swedish society. They lack feasible alternatives so they choose the simplistic but concrete policies of SD. It is time for the established parties to address these and not skirt the issues with abstract theories and ideological arguments. They have to offer the electorate concrete solutions for immigration, integration, crime, begging, healthcare. They need to work to reduce dissatisfaction in society and to bridge the gaps between people. If they can do this, then maybe SD’s policies won’t seem as attractive any more. There’s a cold wind blowing over Sweden today. Winter’s coming. Let’s hope it doesn’t last too long. I am not very political savvy by any means, but I think across Europe other countries are seeing similar shifts in voting.